I have always felt that Jude Law is a rather under appreciated actor. 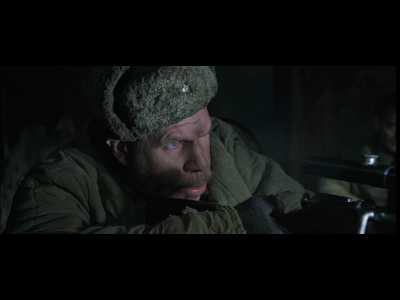 His best performance was most probably in the sci-fi drama Gattaca, however for me, his role as Russian sniper Vasily Zaytsev in Enemy at the Gates comes in at a close second (sorry Mr. Ripley). Indeed whilst recently watching Enemy at the Gates, I got to considering the costume design of the film. 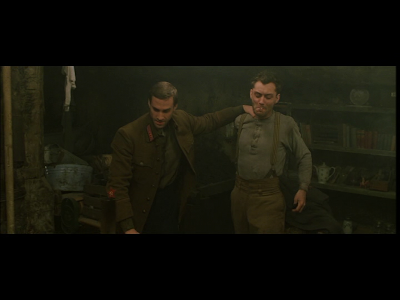 Compared to the likes of other war films, such as Saving Private Ryan, I have always been amazed by the costume design of Enemy at the Gates. For a film such as Saving Private Ryan, I suppose that the standard 1940s American military uniform does perhaps not leave much for interpretation or creative alterations. For me however the look of the costumes felt a tad too clean. Admittedly, being set during the events just after D-Day, the uniforms may have been newly issued to the soldiers specifically for the offensive. And the Americans would have no doubt had better provisions for kitting out soldiers in properly finished and sized uniforms. Director Jean-Jacques Annaud's subject matter however certainly lent itself to the opportunity for far more interesting costume design, and I really do applaud Janty Yates' (costume designer for the likes of Gladiator and Kingdom of Heaven) work. The Soviet soldiers in Stalingrad, and the USSR in general, were notoriously under provisioned and ill equipped. Uniforms were quite literally taken from the dead to clothe the living, or else patched and layered with whatever happened to be at hand simply to weather the cold. I suppose it is my instinctive love for the beauty of survival inspired clothing, nevertheless I found the costume design stunning. The costumes really did seem to fit far more naturally, as indeed did the make up and physical signs of fatigue on the characters. By naturally I do not mean that all the garments fit the characters size wise, but rather in places it was quite clear that they did not. Each character may have worn similar or identical garments, however the way in which they wore it was quite unique. Indeed the potential for layering, and the requirements of urban camouflage as suited to the sniper, allowed for a more exciting design. The unique and well aged finish of garments was clear. I was particularly drawn to the silhouette of the make shift sniper's uniform, of the wide and draped upper half and the slim and fitted bottoms. The uppers were carefully layered, with a quilted coat serving as the outer layer, however the addition of a blanket serving as a cover for sniping was also seen. This heavy top contrasted wonderfully against the thermal leggings and trousers, tapered and tightly bound around the soft leather boots. It is in an odd way actually a silhouette that has been somewhat prominent on the runway of many winter collections these past few years. 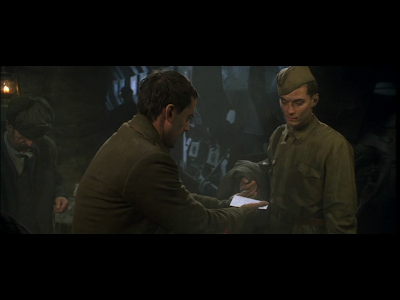 Although one may be drawn to the conclusion that the costume design relied only on the sourcing of original Soviet army uniforms, the ingenuity and care taken to finish each look really did add to the overall look of the film. And I suppose that the uniforms of war shall always inspire as much as the wars themselves. For the uniforms represent the people that wore them, and people inevitably inspire us all the most. Talking about uniforms look up the Stanford Prison Test. People are influenced by what they wear, they are identified by the power or subordination attached to the clothing and in turn take on the role. I agree with U. I adore Jude Law. Really handsome and great actor too..
you're right, there's something inspiring about uniforms. I don't know if you know or not but Jude Law is going to be playing Dr. Watson in the new Sherlock Holmes movie. I think it'll be worth the watch! I correspond with yuh ! I do really like Jude Law. For some reason unknown to me, I've never seen this film. I'd like to though. I'll have to give it a shot. Hope you are doing better. Take care. Cheers! Anytime I think of war movies or military-based movies I always worry that the styling will be boring or cliche, but I have been surprised by a few. In terms of Enemy at the Gates, the pieces were true to the era, but still modern. I actually wanted some of the pices, like the high waisted trousers. I guess I like the idea that uniforms don't have to be predictable. It IS Zombies vs Unicorns!! Good to know that it doesn't just make sense to me. The embroidery part took forever, but I just love running my hands through the stitches. I'm definitely gonna make more bags in the future. 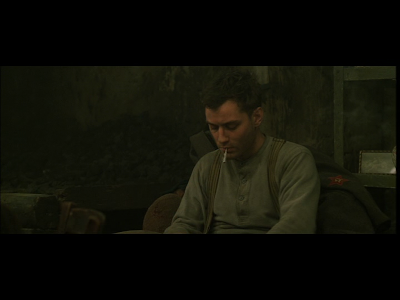 I've watched Enemy at the Gates so many times, and Jude Law is one of my favorite actors. thanks for stopping by at my blog and leaving a comment! 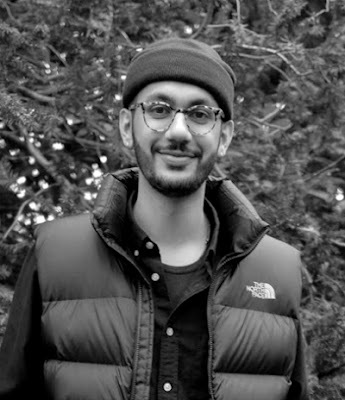 i find your around the world project really intriguing, so i'll go and put down my name.. also, i fnd your blog so interesting i sure i'll come back, and i'd love it if you would exchange links with me! I love Gattaca! 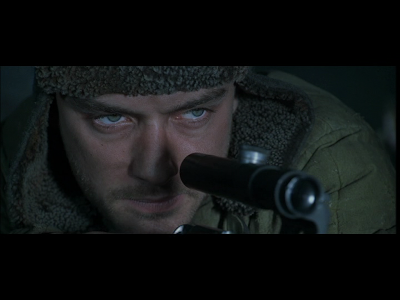 It's such a great movie, and I agree that Jude Law is great in it. I usually don't like war movies, but I may see this one now that you recommended it. jude law can look great in a potato sack! i was just thinking about gattica the other day... what a cool movie. hadn't seen this one, but i'll probably make a point now! as far as war films, i really enjoyed seeing 'letters from iwo jima' only because it's not often we see ww11 films from the japanese perspective, and i'm kind of hoping to see one about hiroshima and nagasaki (from the japanese perspective) as i don't think i've come across such a film, and it's such a compelling story. I love Costume Design, when I studied it in school I didn't give it enough time o'day. Lame, I know...but the details that go into every little thing really strike me now. I'm really taken with your last sentence. the last thing I've seen him in was My blueberry nights..and he just wasn't in it enough. Thanks for the note..and thanks for posting the style of these period piece films on war. I do wonder how the style of costuming will be in the new brad pitt film. Nice movie stills. I have not seen this one. 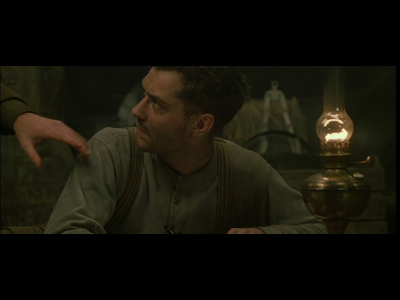 I liked Jude's character in Road to Perdition, and I'm pretty excited to see how he does as Watson in Guy Ritchie's Sherlock Holmes. P.S. I really love Jude Law in The Talented Mr.Ripley! It is funny when I still catch myself using a term from high school when I guess Jude was at the height of his acting.."he's so jude law"..which always meant..he's pretty hawte. You are so right!!! I always think "Blurgh! Jude Law!" and then someone quite rightly corrects me and says "What about Gattaca, what about Closer, what about...."? And, yes - he's actually good if not very good. I think because he's so "handsome" I dismiss him as a pretty boy. Gattaca is after all one of my top five faves! Havent seen that movie! I should download it! I haven't seen this movie, but I really do love Jude in Closer! It's interesting what you write here about the costumes, so maybe I should see it. Oh, by the way! I've finished "The strange Case...." I'm so glad you told me about it, it was such a great read. Absolutely brilliant, it kept me awake all night! you have sold me...I need to see this! Oh, be still my heart....Jude Law---also think that he is an amazing actor and totally underrated. Hope you're doing well love. I can never express how much I admire your writing.... it is always such a joy to read your beautifully written posts. When it comes to historic movies, I find costumes to be one of the most fascinating parts. Not only do they create am entire theme and feel of the movie but also represent a certain time period. I must agree that Jude Law is a fantastic actor, but I think his slightly messy personal life really makes people over look that fact- which is silly. Yeah Jude is a really great actor, loved him in Talented Mr Ripley. I quite like Jude Law. He seems to have something most actors these days lack...a classic-ness about him. So I'm glad I found your blog, thats for damn sure. What a great post - I'm definetly interested in costuming for film and really enjoyed this read. I agree about Mr Jude Law too - I adore him in Gattaca the most - pretty haunting actually. hmmm, i must have missed something because i haven't seen this movie before! I def agree with you here, a lot of the time we don't pay that much attention to the details behind the whole movie i.e the costume etc! I do find this film particularly easy on the eye. I adore Soviet army gear. I'm going hunting for some bits and pieces when I go to Moscow on Saturday. Unfortunately you need to apply to take back anything from the 1950s and before though, so it's not always simple.. I should watch the movie! Have a lovely weekend..
Oh Darling, I love Jude Law too, I'm glad you featured him! :) I haven't seen this film, but military costume has always fascinated me (although I hate wars more than anything else). Film costume in general is an under-researched area I feel. French blogger & fashion journalist Geraldine from Café Mode does great analyses of costumes from the greatest films, if you want to have a look. ive probably said it before but i love the way you write, i saw this movie a while back and i can remember thinking how amazing the tailored uniforms were. Whenever see the words costume design and movie together I automatically think about the film, "The Fifth Element." I can't really think of a better example of a film where the costumes were such an integral part of the film. As excellent as that film was, it wouldn't have reaached the high level that it did if it weren't for the costume design. 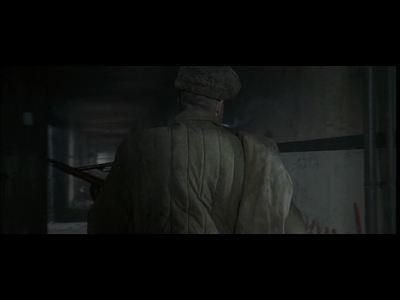 If you wish see the real Soviet Army uniform of WWII, I highly recommend watch Russian movies - in particularly, it's an epic war film "Liveration (Osvobozhdenie)" (1969-1984).